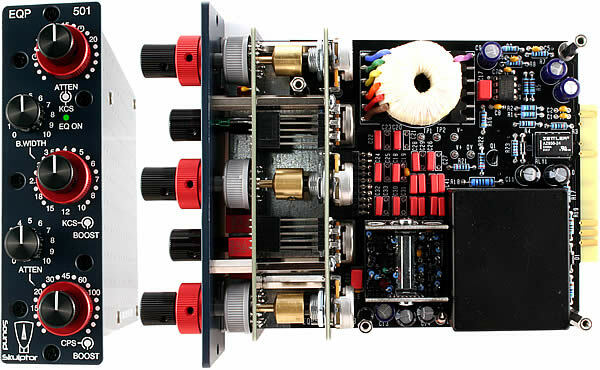 The CP4500 is a Stereo bus compressor based on the design that was originally used in a legendary British console, adapted to the '500' format. It is famous for adding punch and glue to the mixes. 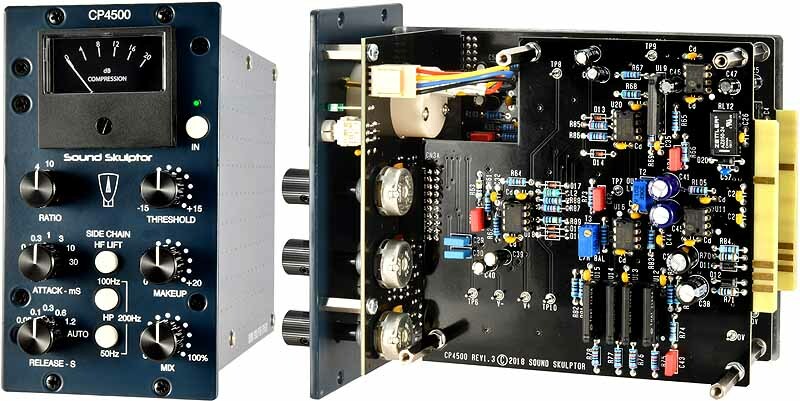 The EQP501 is a passive equalizer based on the classic PULTEC EQP 1A, adapted to the '500' format. It is made of an all passive section followed by a gain make up stage based on a Discrete Op-Amp (DOA). It shines on vocals, bass and drums. The EQP501 retains all the controls from the original but adds some new frequencies to the low and high sections. It delivers the vintage compression and warmth of its ancestor thanks to the optical coupler response, side chain and transformers. The LA502 adds a few features to the original such as a new ratio of 6, two high-pass filter in the side chain and two slower attacks of 10 and 20 ms. The TS500 Tape Simulator is the successor or the Stereo Tape Simulator. It has been adapted to the API* 500 format with a number of enhancements. 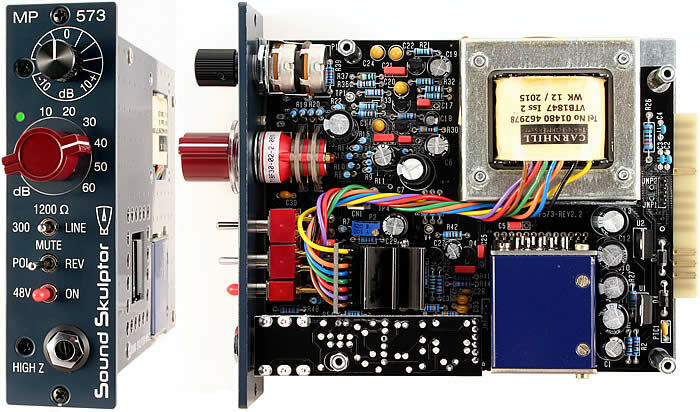 It is an analog processor that recreates the sonic imprint of vintage tape recorders. The effect provides the roundness, the punch, the compression and the saturation of magnetic tape. 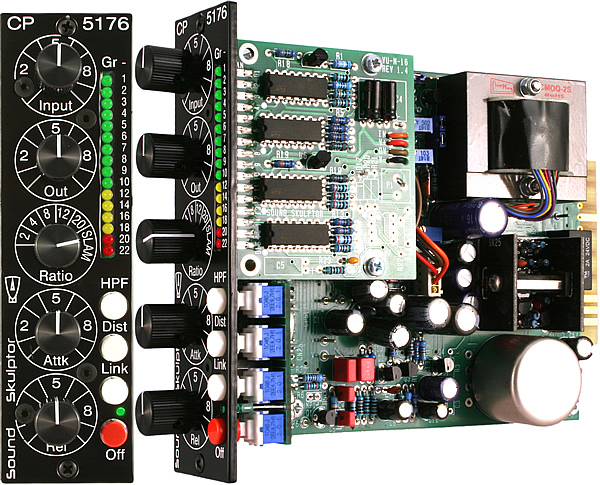 The MP573 is a single ended class A preamp, based on the design that was originally used in the Neve 1290/1073 modules, that has been adapted to the '500' format of API. 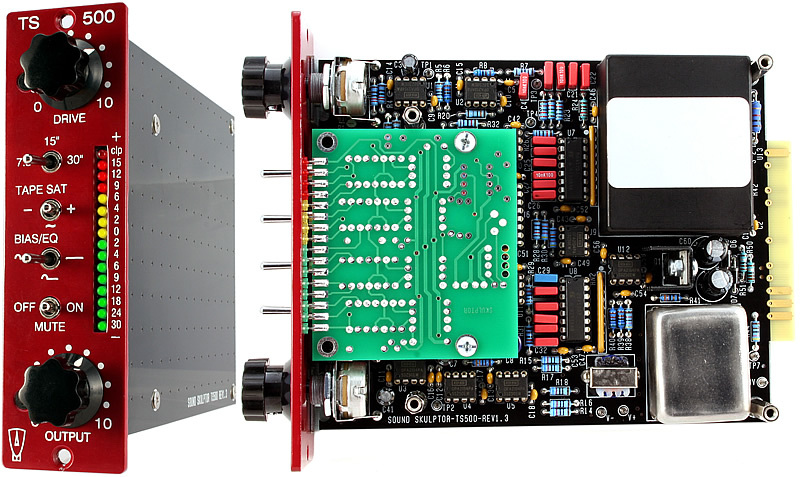 The 501 is a single slot, 500 series compatible case with power supply. Available assembled or as a full kit. 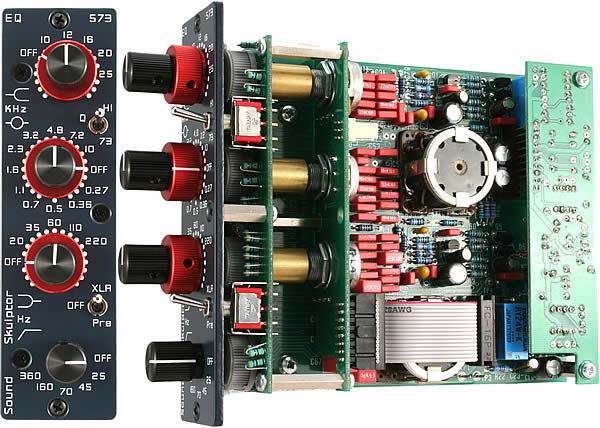 The EQ573 is an equalizer based on the design that was originally used in the Neve 1073 and 1084 modules, that has been adapted to the Lunchbox '500' format. 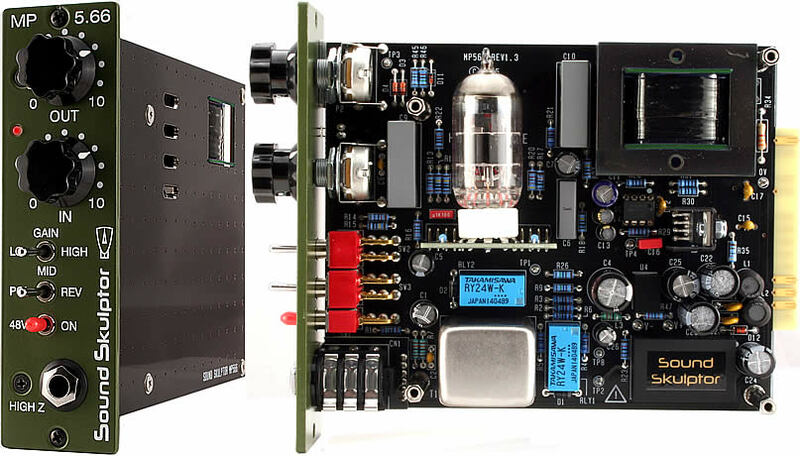 I've looked on your site and can't really see: is there a way to hook up those kits to an already existing (or custom) PSU, in a rack I would make myself? Those MP66 look awesome, they look like they have that special Gers vintage sound (warm, punchy, wich a little crust in the foix gras range) one would be looking for! how do you mount your tube pre in your rack? You are absolutely right about the foie gras crust but you must not forget also the Bordeaux effect in the high end. For sure you can install these modules in your own rack. You just have to provide the ad hoc PSU. I have a connecting diagram available that I will post in the FAQ, in the local forum. The MP66 tube pre uses 2 slots in the rack. They are mounted like the others on 5mm stand-offs. any plans for 500 series modules ? Yes the Euro value is really painful. But most people here think it's cool because they can buy US products cheap. Still wondering about the 500 size. Maybe I am waiting for a new extended standard to come out. Just a bump for Jean-Pierre and Sound Skulptor. I built a rack with four of his modules - two MP32, an MP73 and an MP12. They are beautifully designed, fun to build and they do sound great. I plan on building another rack with two MP66 in it. Those of us who enjoy DIY and kit building are very lucky these days to have so many wonderful choices, from so many talented designers. another bump from me. these kits are made with love! Thanks to Jean-Pierre for this great kit! Nice job! 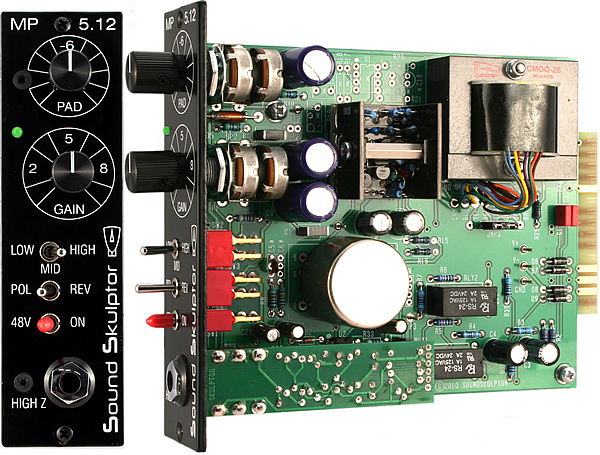 I'm half-way through my dual MP66 kit, which is the second Sound Skulptor rack I have purchased. Very nice kits. I'm new on here and very interested in the STS. Would it be available in 500 series format and what kind of $$?? as above; ballpark €? Looks real cool! Strong interest here for the DIY Tape simulator. We are also considering creating a mini kit that would exclude case, PSU and panel components such as pots, switches and connectors. The advantage for DIY’ers would be the ability to make their own casing as shown in the 2 examples below. hi jp, interested of course!! p.s. your sound samples seems to be pretty heavy processed... nice! I am for a vintage style 2 channel unit for sure!! Any guess for a kit price for 2 channels? +1 on the wondering about rough $$ for the tape simulator! I'm very interested about the tape simulator units. Could you please provide more examples? Some demos with the different "speeds" and maybe even harder distorted stuff? Those tape sim boxes look and sound GREAT! I'm definitely interested in some kits. And I'd probably rather have them in my own case. Nice job!